The dissolution of the socialist community has had severe repercussions on the Cuban economy. Prior to these momentous changes, the former Soviet Union and the socialist nations of Eastern Europe were Cuba’s economic lifeline. In 1989, the most recent year for which official data are available, the former Soviet Union and the socialist countries of Eastern Europe bought about 85 percent of Cuba’s exports and provided a like share of imports; these nations were also the source of the bulk of Cuba’s external financing for economic development. Over the two-year period 1989-90, the former socialist countries severed trade and financial relationships with Cuba, forcing severe adjustments on the island. The set of emergency measures implemented by the Cuban government— beginning in September 1990— aimed at preventing the total economic collapse of the regime, have been referred to by the leadership as the “special period in peacetime,” highlighting that the situation being addressed was the equivalent of wartime conditions, although no open military conflict was present. Austerity measures adopted by the Cuban leadership during the special period— rationing consumption, increasing domestic food production, stimulating exports that generate hard currency flows, attracting foreign investment— have been aimed at operating the economy with much reduced levels of imports and external financial resources. The economic crisis that has swept Cuba in the 1990s, coinciding with the special period in peacetime, has affected every facet of Cuban life. Analysts have focused a great deal of attention on the effects of the crisis on overall levels of economic activity, on population standards of living, or on the performance of specific sectors of the economy (such as sugar cane agriculture, electricity, or transportation). Relatively unstudied, however, are the effects of the economic crisis associated with the special period on other aspects of Cuban life, such as the environment. This paper presents a preliminary analysis of the effects on the Cuban environmental situation of special period policies and outcomes. The analysis is broad, extending beyond the agricultural sector— on which there already has been some published work— and examining special period-environment interactions across the economy at large, including industry, mining, tourism, nutrition, public health, etc. The paper is divided in three sections. The first one gives some necessary background on the state of the environment in Cuba in the late 1980s, that is, prior to the start of the economic crisis associated with the special period. The second section examines aspects of special period policies and outcomes that have had a positive impact on the environment. The third section does the same with regard to those whose impact on the environment has been negative. The paper concludes with a tentative assessment of the overall effect of the special period on the Cuban environmental situation. Many of these environmental stresses were inherited from the past, but some arose or were intensified by sectoral development strategies pursued by the revolutionary government. Urban pollution, for instance, could be partly traced to Cuba’s extreme reliance on inefficient and highly contaminating Soviet and Eastern European-built vehicles and factories. In the agricultural sector, a practice that resulted in much environmental damage was the promotion of Sovietstyle, large-scale state farm production model based on widespread mechanization, heavy chemical inputs (e.g., fertilizers and herbicides), and extensive irrigation (Pérez-López, 1991b; Solares, 1994). The effect of large scale mechanization on the compaction of soils has been reported as severe (Sáez, 1994). The pollution of streams and coastal areas by organic waste discharges from the sugar industry was a major concern for years. By the late 1980s, when sugar production was at its peak, the problem was considered so serious that to lower discharge rates, measures were instituted in more than 90 mills to fertilize sugar cane fields with organic waste (Clark, 1989). Some of Cuba’s bays became severely polluted because of human, industrial, and agricultural discharges, but also by the runoffs associated with the deforestation resulting from strip mining (e.g, in Moa). By the late 1970s, the United Nations Development Program was providing financial and technical assistance to the Cuban government to arrest the growing contamination of Havana harbor (Menéndez, 1979). High levels of industrial and agricultural pollution were also in evidence in the bays of Nipe, Chaparra, and Puerto Padre (Dávalos, 1984). By 1990, Cienfuegos bay was added to the list, partly because of the very inefficient use of existing industrial pollution control systems (Schlachter, 1990). Many instances of soil salinization and erosion can be blamed on waterlogging caused by poor irrigation and drainage practices, by excessive water extraction rates from coastal aquifers, and hare-brained schemes that led to the damming of low water volume streams and rivers that dried out during the dry season months (Díaz-Briquets and Pérez-López, 1993). It is estimated that one million hectares, or about 14 percent of the country’s agricultural surface have excessive salt deposits. Of these, about 600,000 hectares are deemed to have light to modest salinization levels and the rest heavy salinization (“Estudio,” 1991). The regions with the heaviest levels of salinization are in Guantánamo and the Cauto valley. [The special period] is a period of readjustment … requiring maximum economizing and austerity in economic and social policies, along with many creative initiatives, a large number of which have come directly from the people. Many of the steps taken as a result of the special period fit in with the strategic lines prepared by the Revolution. Some of them have helped accelerate the policies put into effect by the country in defense of the environment (Castro, 1992:49). The sector of the economy in which the special period-environment interactions have been positive that has received the greatest attention is agriculture (Carney, 1993). The special period has also positively affected the environmental situation in other economic sectors, such as industry and transportation, and has had some positive (as well as some negative) effects on public health. Economic growth and environmental degradation: Environmental degradation in all societies occurs due to two primary reasons: (1) population growth, urbanization, and industrialization place increasing pressure on the environment; and (2) society fails to incorporate the true cost of environmental resources in its production and consumption decisions (Pearce and Warford, 1993; Espino, 1992:327). To the extent that overall economic activity in Cuba has declined during the special period, so has the degradation of the environment associated with the emission of greenhouse gases from burning fossil fuels, the generation of industrial pollutants, the contamination of water by runoffs of chemical fertilizers and pesticides, etc. The contraction in economic activity no doubt has had some positive impact on the environmental situation in Cuba, particularly since such contraction in economic activity has been very sharp. According to available statistics, Cuba’s gross domestic product (GDP) fell from 19.3 billion pesos in 1989 to 10.0 billion pesos in 1993, or by more than 48 percent. Over the same period, GDP per capita fell from 1,828 pesos to 909 pesos, or by more than 50 percent (Pérez-López, 1995:11). The economy probably contracted again in 1994, although the Economic Commission for Latin America and the Caribbean (ECLAC) has reported that a growth rate of 0.7 percent was achieved in that year (ECLAC, 1995:1). Agriculture: At the end of 1989, the Cuban state owned more than 90 percent of the nation’s land, most of it in the form of state farms (AEC, 1989:185). Agricultural machinery (equipped with internal combustion engines), chemical fertilizers, herbicides, and pesticides were extensively used. In sugar cane agriculture, for example, most planting, cultivating, and harvesting activities were carried out using machinery; in the late 1980s, over 65 percent of sugar cane cutting and 98 percent of sugar cane loading and transportation activities were mechanized (Pérez-López, 1991:68). Sugar cane agriculture also demanded high levels of productive inputs such as fertilizers and herbicides (Alvarez and Peña Castellanos, 1995:10). Burning of oil products in agricultural machinery contributed to air pollution, while use of fertilizers, herbicides, and pesticides did the same for soil and water resources. According to official statistics, the agricultural sector consumed nearly 468,000 metric tons of oil and oil products in 1988, roughly 4 percent of the 11.1 million tons of such products consumed nationally (CEE, 1989). Imports of fertilizers and of herbicides and pesticides amounted to 158 million and 80 million pesos, respectively, in 1989 (AEC, 1989:283), roughly 3 percent of overall imports in that year. The overall import coefficient for fertilizers used in Cuba was 94 percent and for herbicides 97 percent (Rosset and Benjamin, 1994:18). 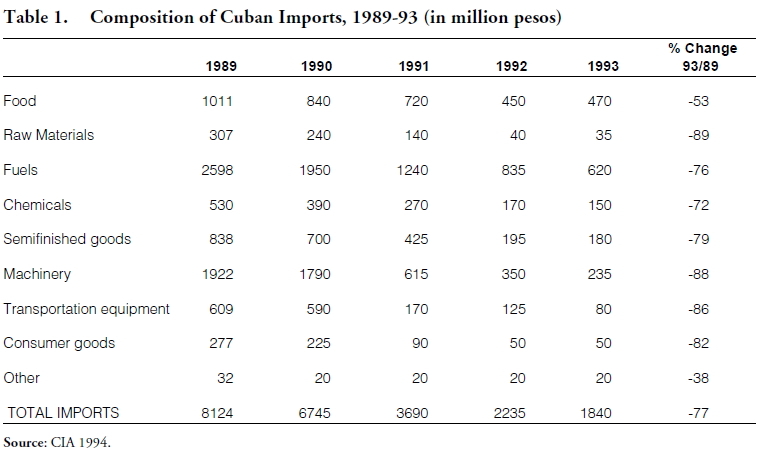 By comparison, in 1992 Cuban fuel imports reached only 6 million metric tons, fertilizer imports 300,000 metric tons (compared to 1.3 million tons in 1989), and pesticides less than 30 million pesos (Lage, 1992). These sharp reductions in imports of fuels, fertilizers, and pesticides during the special period forced changes in agricultural techniques that, although disastrous in terms of agricultural output, have had positive environmental consequences. By November 1991, about 12 percent of Cuba’s stock of agricultural tractors was idle because of lack of fuel, and 100,000 oxen had been trained for duty in animal traction (Roca, 1994:105). In 1992, Cuba applied chemical fertilizers to 817,000 hectares of sugar cane, compared to 2,625,000 hectares in 1989; for herbicides application, the corresponding areas were 1.7 million hectares in 1992 compared to 2.2 million hectares in 1989 (Alvarez and Peña Castellanos, 1995:29). Recent literature on Cuban agriculture (e.g., Dlott et.al. 1993; Gersper et.al., 1993; Vandermeer et.al., 1993; Rosset and Benjamin, 1994a and 1994b) posits that, as a result of the special period exigencies and reductions in imports, Cuba has adopted an environmentally-friendly “alternative model” of agricultural development that de-emphasizes mechanization (and therefore pollutants associated with internal combustion engines) and the use of chemical fertilizers and herbicides. This model was recently described as a “National Experiment in Sustainability” (National Public Radio, 1995). What these observers have failed to note is that the productivity decline associated with this model— a model reminiscent of agricultural practices in Cuba four decades ago— is inconsistent with the demand for agricultural products of a population of eleven million in the 1990s, as opposed to 6 million in the 1950s. Industry: Reductions in imports of fuels, raw materials, machinery, and spare parts have reduced industrial activity and therefore air, soil, and water pollution associated with such activity. Since most industrial plants are located in medium to large urban areas, the principal beneficiaries of reduced pollution levels have been the cities. In 1988, the industrial sector used 6.6 million metric tons of oil products, or nearly 60 percent of overall consumption (CEE, 1989). According to estimates, up to 80 percent of industrial facilities in the island were idle at the end of 1993 due to a dearth of fuel, raw materials, and spare parts (Mesa-Lago 1994:11). This means that most industrial plants were not operating boilers that generate greenhouse gases. The electricity generation industry, in particular, has been heavy hit by the special period fuel and spare part shortages. In 1988, the Cuban electricity system had a generation capacity of 3.853 megawatts and generated 14.453 gigawatt hours of electricity; 99.5 percent of the electricity was produced by thermoelectric plants fueled by residual fuel oil and crude oil (Pérez-López, 1991:240). Electricity generation used up 3.3 million metric tons of liquid fuels, or half of the total amount of oil and oil products consumed by the industrial sector (CEE, 1989). Data are not available on electricity generation during the special period, but fragmentary information suggests that the reduction in electricity production has been significant. In the 1990s, Cuba has instituted a system of rotating blackouts throughout the island. In the summer of 1993, electricity outages stretched for 12-16 hours, with some cities in the interior of the nation facing up to 20 hours of power outages per day. Such power outages not only inconvenienced consumers, but they also shut down factories and affected other public services (Whitefield, 1993). Air pollution from the country’s several cement plants, a major source of contaminants prior to the special period (Norniella, 1985), must have declined considerably as well, due to lowered production after 1989 because of fuel shortages. By the beginning of the special period there was mounting concern about the adverse environmental impact of the cement plants, since they could no longer be fitted with imported pollution abatement equipment (Palazuelos Barrios, 1990a and 1990b). Transportation: In 1988, the transportation sector accounted for 11.9 percent of total energy consumption (CEE, 1989). In August 1990, Cuba instituted mandatory energy conservation measures to address a 2-million ton oil shortfall in energy imports, which included reductions of gasoline deliveries to the state sector of 50 percent and to the private sector of 30 percent (Whitefield, 1990). Subsequent reductions in gasoline allocations have essentially eliminated private transportation via automobiles. The Hungarian buses travel six kilometers on a gallon of fuel. They fill the city with smog. They poison everybody. We could get together some data. We could get statistics on the number of people killed by Hungarian buses (“Castro Discusses,” 1990:15). To address the transportation needs of the population, over 1.2 million bicycles have been imported from the People’s Republic of China and at least 5 bicycle assembly plants set up on the island (Hockstader, 1993). In the city of La Habana alone, it has been estimated that in 1992 there were 500,000 bicycles in operation, serving a population of 2.1 million inhabitants (Carranza Valdés, 1990:151). Because of the drastic decline in the number of internal combustion vehicles in circulation and lower levels of industrial air contamination, the streets of La Ha-bana have become, in the words of one observer, “almost smog free” (National Public Radio, 1995). To make cuts in transportation usage, a solution was introduced which is innovative because of its mass scale: the use of bicycles. Hundreds of thousands of bicycles were imported, several factories were modified to manufacture bicycles and almost a half a million bicycles have been distributed to workers and students. The proliferation of cyclists of all ages is perfectly compatible with the policies promoted for several years to guarantee health for all, including exercise programs for senior citizens. In this way, the current shortages of fuel, although they negatively affect daily life, also have a positive effect on the environment (Castro, 1992:49). Other “ecologically valuable” outcomes of the special period, according to Castro, are “the intensified use of herbal medicine, the promotion of local fruit and vegetable gardens (even in residential areas in yards and terraces), the gradual utilization of animal traction in agriculture, the development of composting, and much more” (Castro, 1992:49-50). As the average daily intake of calories, proteins, and other nutrients has declined, the composition of the Cuban diet has changed. Cubans, accustomed to a diet high in fats and carbohydrates, have not only seen their food intake decline drastically, but have been forced to attempt to supplement their limited diets with domestically-grown fruits and vegetables, many of which are produced in home gardens. While this shift away from fatty foods may be beneficial, the weight of the evidence seems to point out to a decline in health standards as a consequence of the severe deterioration in food intake (see below). Another positive effect of the special period is that it has reduced waste, as recycling has been stepped up. Cubans have become extremely frugal, and people look for all sorts of left overs to make gadgets to make a living or to use at home. To the extent that recycling contributes to the reduction of waste, it makes a positive environmental contribution by limiting the need for dumps. Recycling has also helped alleviate La Habana’s sanitation crisis. The amount of city waste has also declined as people use their meager food leftovers to feed animals (e.g., pigs) in their yards. The economic crisis associated with the special period presents serious challenges to Cuba’s environmental situation and prospects. As two analysts have pointed out, Cuba’s severe economic crisis has forced its government to cut back drastically on its budget for environmental research in its various aspects. Cuba’s vast scientific collections are at risk of swift destruction, for lack of funds for preservation and maintenance. Scientific training has also been curtailed. Many scientists are shifting to other professional work as a result of these paralyzing circumstances. The same economic crisis, moreover, tempts the Cuban government to search for petroleum and mining resources, or to develop tourist facilities, on a scale and at a speed which also increase the likelihood of environmental damage, especially to Cuba’s smaller cays and its marine resources (Cole and Domínguez, 1995:4-5). This section of the paper examines environmental challenges presented by the special period, in particular with regard to the agriculture, industry, mining, tourism, and public health sectors. Agriculture: While the environmental effects of Cuba’s strategy to overcome the economic crisis appear to be largely benign on the agricultural sector, several developments merit continued attention. Cuba has launched an all-out effort to substitute chemical pesticides with biological agents (Shishkoff, 1993). While these initiatives appear at this time to be meritorious from an environmental point of view, they may carry long-term dangers not readily appreciated because they are being implemented on a wide scale without prior adequate experimental study. Of note are some biotechnology products used as substitutes for imported pesticides. Shortages of commercial fuels for home cooking (electricity, kerosene, gas) during the special period have brought about increased demand for firewood and charcoal, and placed additional pressure on already sparse Cuban forest resources (Espino, 1992:331). The increased demand for firewood has brought about the indiscriminate cutting of trees and bushes, adding to Cuba’s already serious problem of soil erosion. Particularly damaging has been the cutting down of mangroves to produce charcoal (Solano, 1995). The problem is reported to be most acute in the Zapata swamp where military brigades are harvesting soplillo tree stands in selected areas to supply the city of La Habana with charcoal. The government claims, however, that the areas chosen for logging are carefully selected to protect the swamp’s unique natural habitat (National Public Radio, 1995). Industry: The overall reduction in imported fuels, machinery, and raw materials during the special period has brought about a slow down in industrial activity and pollution. Government policies to overcome the crisis nevertheless have put additional pressure on the environment. To ease the bottleneck caused by shortages in imported fuels, Cuba has gone all out to increase domestic production and use of crude oil. The drive to increase crude production has meant that drilling and production has been permitted in certain areas that were formerly considered environmentally fragile, for example in coastal areas. Cuba has also approved joint ventures with foreign firms to explore offshore, potentially affecting the ocean environment and risking the possibility of an offshore oil spill. Because of the financial pinch, Cuba has bought cheap oil in the world market to fire its power plants; this low-quality oil generates dense clouds of pollution that embrace La Habana and other areas near the power plants (McGeary and Booth, 1993:44). Domestically-produced crude oil, used extensively in power plants, is of very low quality and has a very high sulphur content, thus generating a great deal of air pollution. Special period financial strains have stopped Cuba’s efforts to build a nuclear electricity generation plant, a source of electricity that would be more environmentally friendly in terms of carbon dioxide emissions, although it would raise other environmental concerns associated with nuclear radiation. Because of leaky equipment and other factors, the sulphur compounds used in the process pollute the air and water, producing what residents say is acid rain. Heavy erosion from surface mining is also filling Moa Bay with earth (Knox, 1995). Residents of Moa told the same journalist that they took it for granted that “one of the reasons a foreign mining company would be interested in operating in Cuba was that environmental standards would be lower” (Knox, 1995). The “Pedro Soto Alba” nickel plant, the subject of the Sherritt, Inc. joint venture, reportedly produces 12,000 cubic meters of liquid wastes per day. These wastes, which are disposed of in the sea, carry a wide range of light and heavy metals, such as sulfates and great amounts of sulfuric acid. According to a Cuban journalist Every day, 72 tons of aluminum, 48 tons of chrome, 15 tons of magnesium, and 30 tons of the dangerous sulfuric acid get dumped into the sea. This harms the marine flora and fauna and in the long term, could cause irreversible damage (“Nickel Plant,” 1994). Further, some environmentalists have expressed concern that coral reefs from Moa Bay are being dredged so that the calcium carbonate they contain can be used to neutralize the sulfuric acid in waste materials (Oro, 1992:82). A spokesperson for Sherritt, Inc. has admitted that materials of coral reef origin are being used for this purpose, from “coral mud that has long decayed by natural methods…we don’t do anything to wreck reefs” (Knox, 1995). Strip mining of the nickel ores has been an environmental concern for years, as remediation and reforestation have not kept pace with mining activity. This is a major source of environmental damage at Moa Bay, according to Sherritt, Inc. Chairman Ian Delany (Knox, 1995). New plants are on the drawing board. Other joint ventures to exploit copper, gold, and silver deposits also raise environmental concerns. Tourism: One of the leading sectors in Cuba’s adjustment policies during the special period is international tourism. The Cuban leadership has identified the international tourism industry as one that can contribute significantly to the country’s hard currency balances and has aggressively sought foreign capital to develop additional tourist facilities, particularly seashore resorts. The Cuban government claims to be sensitive to the fact that growth in the tourist industry depends not only on the availability of more and better facilities, but also on the implementation of cautious development plans to preserve the country’s natural tourist attractions. However, in expanding its tourism infrastructure— hotels, recreation facilities, roads, airports, etc.— Cuba has often emphasized speed and low cost to the detriment of the environment. To allow access by tourists to beaches in the numerous small keys that surround the island, particularly on its northern coast, Cuban tourism authorities have constructed causeways bridging barrier islands to the mainland and to one another called “pedraplenes.” These “pedraplenes” block the movement of water in the intracoastal waters, exacerbating contamination and destroying coastal and marine habitats (Espino, 1992:335). Examples of “pedraplenes” deemed to have caused substantial harm to the environment and fishing resources include the one joining the islands of Turiguanó and Cayo Coco and others in Caibarién and the northern region of Ciego de Avila province (Solano, 1995). sacrifice the environment in the name of economic survival (National Public Radio, 1995). The growth in tourism, and in particular the development of the country’s pristine outer keys and islets, has alarmed the conservation community. Some in this community note that while the country was sheltered from market forces (due to Soviet subsidies), it did not have to face the same tough growth/ environmental tradeoffs other island countries in the Caribbean did. As a result, Cuba remains as one of the world’s “richest storehouses of unique animals” (Dewar, 1993), with some experts estimating that about 40 percent of Cuba’s species still remain to be discovered (National Public Radio, 1995). Continued efforts to develop the international tourism industry can only exacerbate pressures on natural resources, and lead to the decimation of rare species. Transportation: Cuba’s transportation stock is getting older and, because of poor maintenance and lack of spare parts, can only be more polluting and environmentally unfriendly. As long as the economic crisis continues, Cuba will not be able to modernize its fleet of cars, trucks, and buses (other than for those few vehicles serving the tourist industry). The occasional used buses donated to Cuba by Canada, Spain, and other countries as a rule have been retired after years of service, tend to be obsolete, and do not have the latest environmental control technology. Public Health: The special period has had considerable negative impacts on the health of Cubans and on the vaunted public health system. Some of these problems have been caused in part by some of the measures introduced to cope with the deteriorated economic conditions. There are reports, for example, of a major increase in the number of deaths and injuries associated with the manifold increase in bicycle ridership. As in every other sector of the economy, poor maintenance and lack of spare parts has taken a toll, with insufficient fuel available to pump and distribute underground water and water from aboveground reservoirs. The dearth of foreign exchange may have also interfered with the country’s ability to purify its potable water supply. Several urban health problems can be attributed to the practice of raising chickens and pigs at home. Because fuel and imported spare parts are lacking, many sanitation trucks in the city have been taken out of service. Garbage collection schedules are irregular and often carried out with animal powered vehicles. The incidence of gastrointestinal ailments is certain to have risen as the availability of running water for distribution has declined and become more erratic. With the shift of urban workers to agricultural pursuits, in some rural areas the public health situation may have worsened as well. In agricultural areas receiving large contingents of urban-origin workers, the sanitary infrastructures is likely to be insufficient to accommodate the needs of a larger population. In 1993, Cuba reported the outbreak of a mysterious disease that blinded people. There has been considerable speculation about what the cause of the disease might have been. A team of physicians from the Pan American Health Organization (PAHO) found that 50,000 of the 11 million inhabitants were suffering from such maladies as optic neuropathy (visual loss), deafness, sensory neuropathy (loss of sensation in the hands and feet) and a spinal cord disorder that impaired walking and bladder control (Stix, 1995:32). The PAHO team concluded that a spare diet, along with great physical exertion because of the lack of transportation, had caused severe thiamine deficiency and the outbreak of neuropathy, which was curbed through the distribution of B vitamins to the population (Stix, 1995:32). According to health specialists, the scarcity of certain medications and foodstuffs has contributed to a modest increase in the incidence of low birth weight among Cuban infants that occurred in 1992 and to a suspected rise in the infant mortality rate (French, 1993). Data from a recent report indicate that the percent of low birth-weight babies rose from 7.6 percent in 1990 to 9 percent in 1993, while the percent of under weight women entering pregnancy increased from 8.7 to 10 percent between 1990 and 1993. There have also been reports of significant increases in mortality among residents of nursing homes in 1993 (Johnson, 1993). The gravity of the dietary changes are summarized in the same report: between 1989 and 1993 the daily per capita nutrient intake has declined by 40 percent in proteins, 64 in fats, 67 percent in Vitamin A, 62 percent in vitamins C, 22 percent in iron, and 19 percent in calcium (“U.S. Blockade Causes,” 1995:4). Cuba’s advanced system of health care delivery, one of the most trumpeted accomplishments of the revolutionary government, has not been spared by the economic crisis and the end of subsidies from the former Soviet Union and the socialist countries. According to an analyst who visited Cuba in the autumn of 1992, the country’s health care system was already “disintegrating” (Barrett, 1993:1). This analyst observed a shortage of imported medical products such as over-the-counter and prescription medications, anesthetics, suture, surgical gloves, X-ray plates, diagnostic kits, etc. ; also in short supply in the autumn of 1992 were soap, detergents, other personal hygiene items, chlorine to treat the public water supply, and pesticides to control insects. The special period has had a profound effect on Cuba’s environmental situation. It has, on the one hand, arrested a secular process of environmental deterioration in the agricultural sector that was vastly aggravated by the uncritical adoption, since the 1960s, of the large-scale, input-intensive farm model imported from the Soviet Union. This agricultural development model, predicated on the heavy use of chemical inputs, mechanization, and irrigation, contributed to the deterioration of Cuba’s soils and the contamination of its waters. The collapse of the economy has also served to reduce industrial pollution. The adoption of a Sovietinspired model of industrial development was environmentally damaging, since ecological safeguards and associated technologies were not a priority. Cuba’s industrial infrastructure, including its oil refineries and cement plants, is inefficient and a major source of air and water pollutants. Another important pollution source is the technologically-backward national fleet of cars, trucks, and buses, mostly imported from the former Soviet Union and the Eastern European countries. On the other hand, many of the economic emergency measures introduced during the special period convey grave threats to the environment. Particularly alarming are those associated with the development of the mining and tourist industry. The Castro government, in its zeal to promote the development of the latter sector, appears to be repeating the same mistakes responsible for the ecological deterioration of most insular Caribbean countries. What is undeniable is that, with the decline in imports, particularly fuel, and the general economic collapse, agricultural and industrial pollution has declined, but at a substantial economic cost. The economic/environmental interactions are complex. For example, the reduction in the volume of imported fuels has stimulated the use of firewood and charcoal as cooking fuels, with adverse implications for forest resources and soil erosion. The long-term environmental effects of these developments remain to be seen. Cuba’s economic and political future is as uncertain as its environmental future. Economic recovery is likely to exacerbate the same environmental pressures alleviated under the special period. Cuba’s environmental tomorrow will depend on the development model the country pursues in years to come, and on the extent to which this model takes into account economic/ environmental tradeoffs regarding production and consumption decisions. Alvarez, José, and Lázaro Peña Castellanos. 1995. Preliminary Study of the Sugar Industries in Cuba and Florida Within the Context of the World Sugar Market. International Working Paper Series IW95-6. Gainesville: Institute of Food and Agricultural Sciences, University of Florida. Anuario estadístico de Cuba (AEC). 1989. La Habana: Comité Estatal de Estadísticas. Barrett, Kathleen. 1993. The Collapse of the Soviet Union and the Eastern Bloc: Effects on Cuban Health Care. Cuban Briefing Paper No. 2. Washington: Center for Latin American Studies, Georgetown University. Barrio Menéndez, Emilio del. 1979. “Comenzó a materializarse proyecto para investigar y controlar la contaminación marina en Cuba,” Granma (28 November) 1. “Carlos Lage Comments on Economy.” 1992. Havana Radio Rebelde Network (7 November), as reproduced in FBIS-LAT-92-219 (12 November 1993) 2-14. “Carlos Lage Interview on Economic Situation.” 1993. Havana Radio Rebelde Network (3 November), as reproduced in FBIS-LAT-93-216A (10 November 1993) 2-15. Carney, Judith A. 1993. (editor) “Low-Input Sustainable Agriculture in Cuba,” special issue, Agriculture and Human Values, 10:3. Carranza Valdés, Julio. 1992. “Cuba: Los retos de la economía.” Cuadernos de Nuestra América 9:19 (July-December) 131-158. Castro, Fidel. 1993. Tomorrow is Too Late. Melbourne: Ocean Press. “Castro Discusses Revolution, USSR, Nicaragua.” 1990. Havana Domestic Radio and Television Services (7 March), as reproduced in FBIS-LAT90-046 (8 March) 1-17. Central Intelligence Agency (CIA). 1994. Cuba: Handbook of Trade Statistics, 1994. ALA 9410011. Washington. Clark, Ismael. 1989. “Problemas ambientales en Cuba y en el mundo.” Granma (5 June) 4. Cole, Sally, and Jorge I. Domínguez. 1995. “U.S.Cuban Environmental Cooperation: Shared Interests, Problems, and Opportunities.” In The Environment in U.S.-Cuban Relations: Opportunities for Cooperation, pp. 1-8. Washington: Inter-American Dialogue. Compendio estadístico de energía (CEE). 1989. La Habana: Comité Estatal de Estadísticas. “Crítica la situación del transporte público en Cuba.” 1993. Diario las Américas (8 May) 7A. Dávalos, Fernando. 1984. “En tres años la bahía de Nipe será esteril, si no se detiene la contaminación,” Granma (11 September) 3. Dewar, Heather. 1993. “Unlocking the Mysteries of Cuba’s Rare Species,” The Miami Herald, (26 October) 1A. Díaz-Briquets, Sergio, and Jorge Pérez-López. 1993. “Water, Development, and Environment in Cuba: A First Look.” In Cuba in Transition, Volume 3 — Papers and Proceedings of the Third Annual Meeting of the Association for the Study of the Cuban Economy, pp. 123-138. Miami: Florida International University. Dlott, Jeff, Ivette Perfecto, Peter Rosset, Larry Burkham, Julio Monterrey, and John Vandermeer. 1993. “Management of Insect Pests and Weeds.” Agriculture and Human Values 10:3 (Summer) 9-15. Economic Commission for Latin America and the Caribbean. 1995. “Cuba: Evolución Económica durante 1994,” LC/MEX/R.524, Mexico, 23 May. Espino, María Dolores. 1992. “Environmental Deterioration and Protection in Socialist Cuba.” In Cuba in Transition, Volume 2— Papers and Proceedings of the Second Annual Meeting of the Association for the Study of the Cuban Economy, pp. 327-342. Miami: Florida International University. “Estudio para utilizar suelos con salinidad.” 1991. Trabajadores (15 July) 12. Farah, Douglas. 1992. “Cubans Are Feeling Unempowered.” The Washington Post (21 December) A15. French, Howard. 1993. “Cuba’s Ills Encroach on Health.” The New York Times (16 July) A3. Gersper, Paul L., Carmen S. Rodríguez-Barbosa, and Laura F. Orlando. 1993. “Soil Conservation in Cuba: A Key to the New Model for Agriculture.” Agriculture and Human Values 10:3 (Summer) 16-23. Inter-American Dialogue. 1995. The Environment in U.S.-Cuban Relations: Opportunities for Cooperation, Washington. Johnson, Tim. 1993. “Crisis cubana cobra alto precio a ancianos.” El Nuevo Herald (12 July) 1A, 5A. Knox, Paul. 1995. “Sherritt Breathes Life Into Cuba Mine,” The Globe and Mail (31 July). McGeary, Johanna, and Cathy Booth. 1993. “Cuba Alone.” Time (6 December) 42-54. Mesa-Lago, Carmelo. 1994. Are Economic Reforms Propelling Cuba to the Market? Coral Gables: North-South Center, University of Miami. National Public Radio. 1995. Broadcast of “All Things Considered,” (30 May). “Nickel Plant Said to Pollute Sea with Metals, Acids.” 1994. Havana Prensa Latina (9 December), as reproduced in FBIS-LAT–94-238 (12 December) 15. Norniella, José M. 1982. “Contará la fábrica de cemento de Nuevitas para 1985, con tres electrofiltros que evitarán el escape de polvo a la atmosfera,” Granma (27 October) 3. Environmental Crisis in Cuba. Miami: The Endowment for Cuban American Studies. Palazuelos Barrios, Raúl. 1990a. “Cuatro hitos de una rehabilitación industrial,” Granma (12 April) 1-2. Palazuelos Barrios, Raúl. 1990b. “Avanza rehabilitación de la primera línea de la René Arcay,” Granma (22 August) 2. Pearce, David W. and Jeremy J. Wardford. 1993. World Without End: Economics, Environment, and Sustainable Development, Oxford University Press (for The World Bank). Pérez-López, Jorge F. 1991a. “Cuba’s Transition to Market-Based Energy Prices.” In Cuba in Transition, Volume 1— Papers and Proceedings of the Third Annual Meeting of the Association for the Study of the Cuban Economy, pp. 221-241. Miami: Florida International University.
. 1991b. The Economics of Cuban Sugar. Pittsburgh: University of Pittsburgh Press.
. 1995. “Castro Tries Survival Strategy.” Transition 6:3 (March) 11-14. Roca, Sergio. 1994. “Reflections on Economic Policy: Cuba’s Food Program.” In Cuba at a Crossroads: Politics and Economics After the Fourth Party Congress, pp. 94-117. Gainesville: University Press of Florida. Rosset, Peter, and Medea Benjamin. 1994a. “Cuba’s Nationwide Conversion to Organic Agricul Experiment with Organic Agriculture. Melbourne: Ocean Press. Sáez, Héctor R. 1994. “The Environmental Consequences of Agricultural Development in Cuba,” paper presented to the XVIII International Congress of the Latin American Studies Association, 10-12 March. Schlachter, Alexis. 1990. “Analizán contaminación marina en zonas de Cuba,” Granma (22 June) 2. Solano, Rafael. 1995. “Catástrofe del ecosistema cubano.” El Nuevo Herald (22 April) 15A. Solares, Andrés J. 1994. “Situación del medio ambiente en Cuba, in Colegio de Ingenieros Agrónomos y Azucareros, Desarrollo Agrícola en Cuba, Vol. II, Miami. Stix, Gary. 1995. “Ban That Embargo.” Scientific American 272:3 (March) 32-34. “U.S. Blockade Causes Significant Economic Losses in 1994. 1995. FBIS-LAT-95-141, 3-4. Vandermeer, John, Judith Carney, Paul Gesper, Ivette Perfecto, and Peter Rosset. 1993. “Cuba and the Dilemma of Modern Agriculture.” Agriculture and Human Values 10:3 (Summer) 3-8. Whitefield, Mimi. 1990. “Cuba admite problemas con petróleo.” El Nuevo Herald (20 June) 1A, 5A. ture.” Capitalism, Nature, Socialism 5:3 (Septem- . 1993. “Blackouts Increase Miseries for Cuber) 79-97. bans.” The Miami Herald (11 August) 6A.